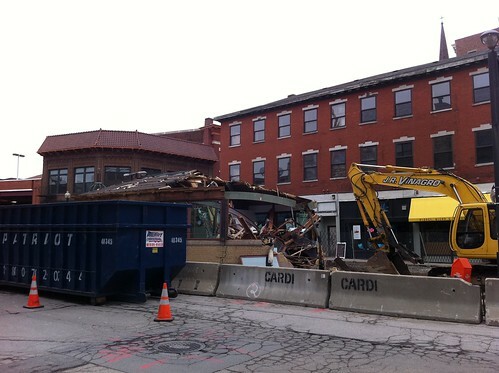 Photos from lunchtime today of the Weybosset Street Comfort Station coming down. 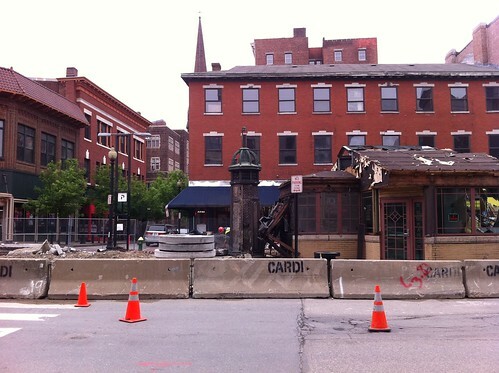 I’m sorry that the only part of this little building that will remain is the earliest piece, which is the tower like form, but I am glad that it, will in fact, remain and be incorporated into the new streetscape of Weybosset Street. I will not miss the well-intentioned. if oversized, police kiosk which was attached to the back of this beautifully detailed and imaginative little building in the Cianci Era. 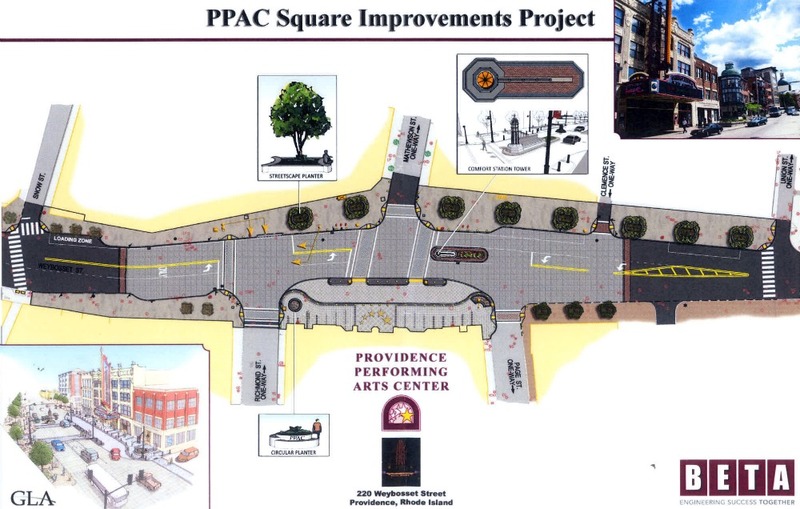 Providence Preservation Society will post a rendering on our website (as soon as we determine to whom credit for the image should be given of the proposed reconfiguration of Weybosset Street showing the tower. There’s a little thumbnail view of it in this image. re: thumbnail – that is about the ugliest page of drawings in the history of urban design. Who did them – an eighth grader for her/his community service project ? 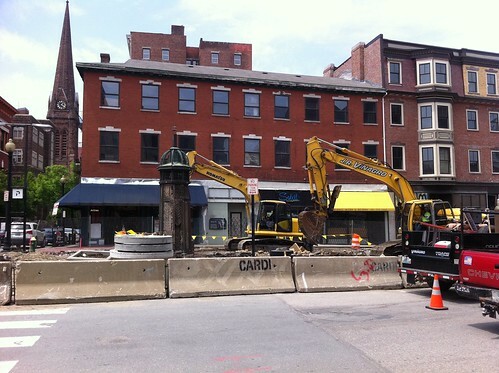 The tree wells are hideously ugly and a poor substitute for the generous urbanity of the large planters that were removed with provided for large trees and extensive linear feet of areas for sitting and casual encounters. 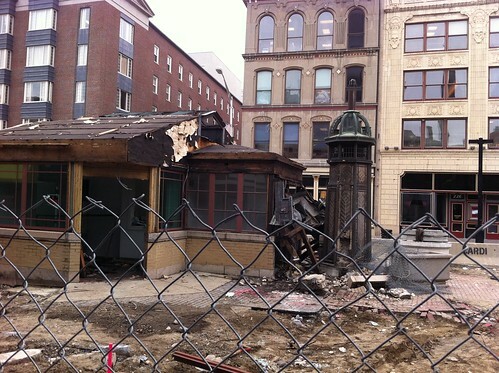 We think Kennedy Plaza is an ugly failure ? 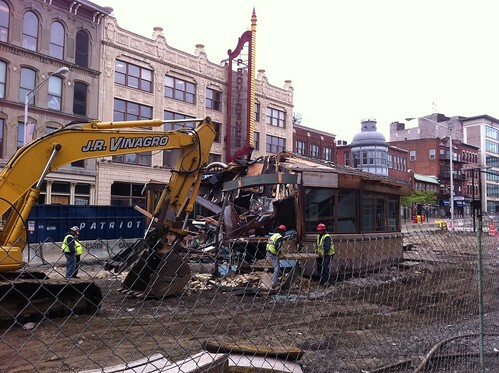 Wait until this is done. How depressing. I’m sure having two way traffic and more parking will be worth it though. Oh and the drop off for PPAC. 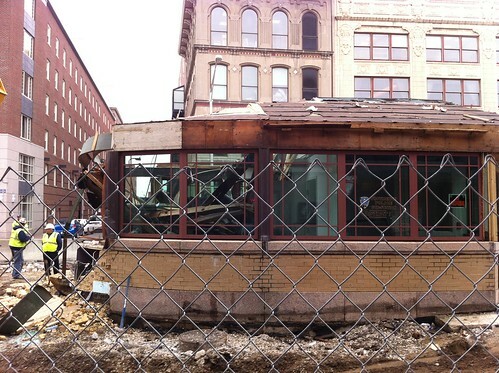 Cianci ruined the comfort station decades ago with the over-sized police sub-station addition. I went by the site as they were doing the work yesterday and it appeared that part of the tower’s surface was damaged by the demo. This design leaves does leave open the possibility of replacing the turning lanes with a median that would improve the pedestrian experience of crossing the streets and force slower traffic patterns. The placement of the tower median provides an example for duplication down the road.